The hip-hop super producer is reportedly furious over Surviving Compton: Dre, Suge & Michel'le, produced by Sony Pictures, that shows Dre as a woman beater. The Lifetime film - starring Rhyon Nicole Brown as Michel’le, Curtis Hamilton as Dr. Dre, and R. Marcos Taylor reprising his Straight Outta Compton role as Suge Knight - will chronicle R&B singer Michel’le's beginnings during N.W.A.’s rise in the music industry to her allegedly abusive romance with Dr. Dre. The singer-songwriter had a son with Dre and a daughter with Knight. 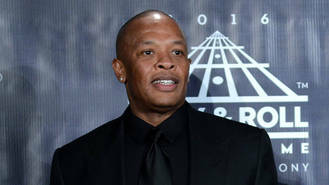 Dre, real name Andre Romelle Young, instructed his legal team to send a cease and desist letter to Sony, threatening to take them to court if the TV movie ever airs, TMZ.com reports. The 51-year-old denies any domestic violence allegations, and his legal team have also threatened legal action against 45-year-old Michel'le, who was heavily involved in the making of the Lifetime movie, and served as narrator. The film reportedly documents Dre and Michel'le's turbulent six-year relationship more than 30 years ago. In the letter from Dre's legal team, they say she has never accused him of any abuse, nor hinted at any violent behaviour on his part. They also add she never sought any medical treatment, or filed a police report. The movie is set to air on 15 October (16).